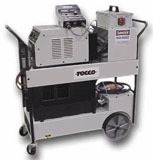 Portability for the TOCCOtron AC System. Capable of accepting 230/460 for the 5/10kW. Stepdown transformer provides 120 for the water system. Storage for all inter-connect cables.